Seabegs Wood was the site of a Roman fortlet on the Antonine Wall in Scotland. At Seabegs, the outline of Antonine's Wall, has lasted. Archaeologists from previous generations recorded this and stated that the ditch was deep and watterlogged. There is an underpass under the Forth and Clyde Canal nearby known locally as the Pend. In in the 1890s, the Antonine Wall Committee of Glasgow Archaeological Society’s cut several trenches across the Roman rampart. These uncovered its stone base. Subsequent excavations in 1977 found a Roman fortlet attached to the south of the Rampart. In 1981, a mound was examined but little has been discovered. The neighbouring forts to this fortlet are Castlecary in the west and Rough Castle in the east. Sir George Macdonald and others theorized that because these neighbouring fort were relatively widespread another structure was likely in the Seabegs area. No coinage has been recovered nor any inscriptions. There are two marching camps nearby at Dalnair and Milnquarter. Many Roman forts along the wall held garrisons of around 500 men. Larger forts like Castlecary and Birrens had a nominal cohort of 1000 men but probably sheltered women and children as well although the troops were not allowed to marry. There is likely too to have been large communities of civilians around the site. ^ "Seabegs Wood". Open Street Map. Retrieved 18 November 2017. ^ "Seabegs Wood". CANMORE. Royal Commission on the Ancient and Historical Monuments of Scotland. Retrieved 2017-11-14. ^ "SEABEGS WOOD: FORTLET, SECTION OF WALL, AND MILITARY WAY" (PDF). Frontiers of the Roman Empire. Retrieved 18 November 2017. ^ "6a Seabegs Wood, from Bonnybridge and 6a Seabegs Wood, from Underwood Lockhouse" (PDF). Falkirk Council. Retrieved 18 November 2017. ^ Macdonald, Sir George (1934). The Roman wall in Scotland, by Sir George Macdonald (2d ed., rev., enl., and in great part rewritten ed.). Oxford: The Clarendon press. p. 239–240. Retrieved 11 October 2017. 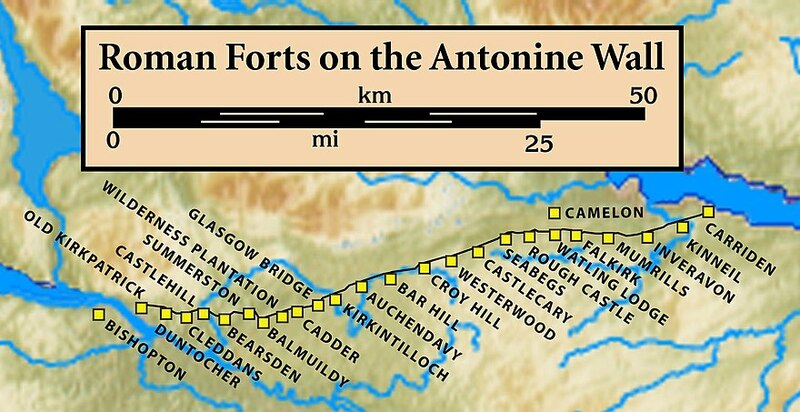 ^ "Seabegs Antonine Wall Fortlet & Camps". Retrieved 14 November 2017. ^ "Soldier". Frontiers of the Roman Empire. Retrieved 21 October 2017. ^ Miller, S. N. (1952). The Roman Occupation Of South Western Scotland Being Reports Of Excavations And Surveys Carried Out Under The Auspices Of The Glasgow Archaeological Society By John Clarke, J. M. Davidson, Anne S. Robertson, J. K. St. Joseph, Edited For The Society With An Historical Survey By S. N. Miller. Glasgow: Robert Maclehose & Company Limited. Retrieved 11 October 2017. ^ "Children". Frontiers of the Roman Empire. Retrieved 21 October 2017. ^ "Roman child's leather shoe". A History of the World. BBC. Retrieved 17 October 2017. ^ Rohl, Darrell, Jesse. "More than a Roman Monument: A Place-centred Approach to the Long-term History and Archaeology of the Antonine Wall" (PDF). Durham Theses. Durham University. Available at Durham E-Theses Online ref: 9458. Retrieved 14 October 2017. This page was last edited on 19 August 2018, at 14:15 (UTC).